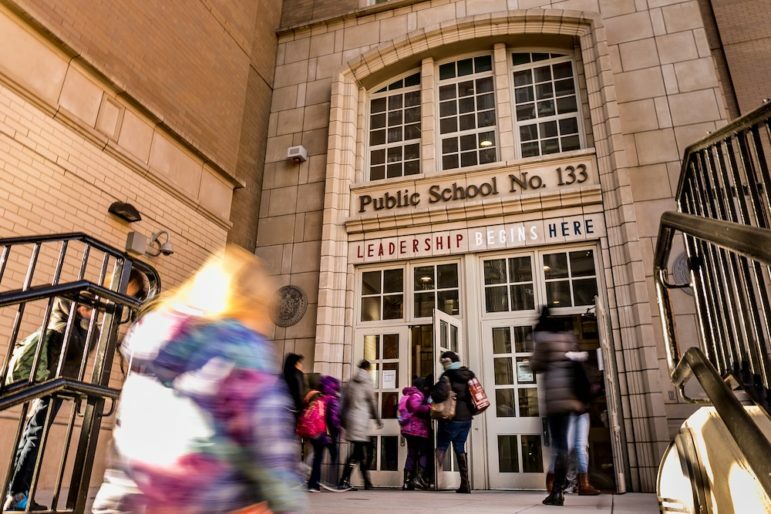 PS 133 in Park Slope tweaked its admissions criteria in 2012 to broaden its geographic zone and aim to enroll low-income children and English language learners. The school now is 27 percent Black, 32 percent Latino, 31 percent White and 3 percent Asian. PS 64 and the Earth School have a lot in common. The elementary schools share a building near Tompkins Square Park. 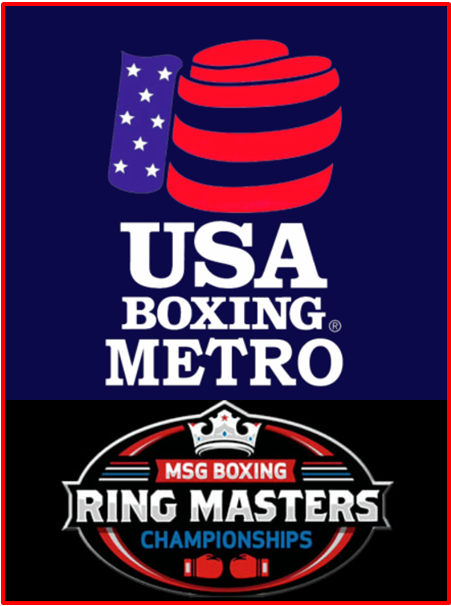 Both are open to any student living in Lower Manhattan’s District 1 and neither considers academic or artistic ability in admissions. But despite the similarities, striking differences separate the two. About two thirds of the students at PS 64 are Latino, and many live nearby. Ninety-three percent qualify for free or reduced price lunch. The Earth School pulls students from all over the district and has a more racially diverse student body. Less than half its students are low-income. Standardized test scores at the Earth School are substantially higher, particularly in reading, than at the school next door. 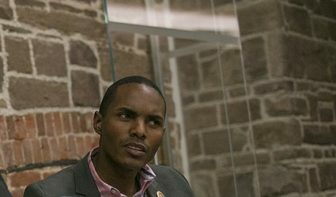 “The mayor has convinced himself, like many other leaders, that patterns of housing segregation are so deeply ingrained it makes desegregation impossible,” says Bronx City Councilmember Ritchie Torres, who has sponsored several bills on school diversity, but in some areas, he says, “That’s not the case. … It’s explained by public policy choices.”. A December 2015 study by the Center for NYC Affairs at the New School found many racially or economically segregated schools in neighborhoods with a mix of races, ethnicities and income groups. At 332 of the city’s 734 neighborhood elementary schools at least 90 percent of the students are Black or Latino, the report found, but 59 of these schools are in neighborhoods that are less than 80 percent Black and Latino. And in 124 elementary schools the students’ average estimated income was substantially below that of their neighborhoods, partly because affluent parents have more alternatives to public schools than poorer ones. 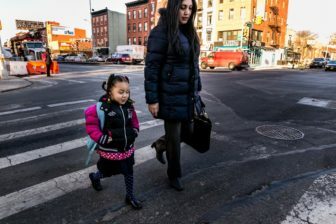 Differences between schools and their surrounding communities were most pronounced on the Upper West Side, in Harlem and in downtown Brooklyn. At the same time, a smattering of schools across the city is substantially richer and or whiter than their surrounding areas. PS 303, the Academy for Excellence in the Arts in Forest Hills, serves a zone that, according to the Center for NYC Affairs, is 46 percent Black and Latino. The school, though, is only 19 percent Black and Latino, and its students come from families with incomes 12 percent above the zone average. None of this is to say New York is not a deeply segregated city and or to deny that housing pattern play a major role in creating what the UCLA Civil Rights project in 2014 described as “one of the most segregated public school systems in the nation.” There are large swaths of the city, notably in the Bronx and parts of Brooklyn, where almost all students are Black and Latino and low income, although there may be discrepancies between schools in the number of homeless students, say, or English language learners. Overall the city public schools are 16 percent Asian, 27 percent black, 41 percent Latino and 15 percent white, according to Department of Education figures for 2015-16. Seventy-seven percent of students are classified as low-income. In seven of the city’s 32 community school districts, less than 2 percent of students are white, with Asians also accounting for a very small percentage of students in most of those districts. In four districts more than 90 percent of students are low-income. But it seems apparent that city policies, rather than reducing the segregation have exacerbated it. To zone or not to zone? It starts with school zones—the lines drawn by Community Education Councils and the Department of Education that determine which elementary school most city children attend. (There also are zones for some middle and high schools.) Among them are masterpieces of educational gerrymandering. On the Upper West Side, since the 1960s, PS 199 has served all six buildings in the Lincoln Towers condominium complex, while PS 191 serves an adjacent area that includes Amsterdam Houses, a large public housing complex. Today, as the Department of Education tries to redraw the zones, PS 199 is 63 percent white, with only 7 percent of children qualifying for free or reduced lunch. At PS 191, 81 percent of children are Black or Latino and 73 percent qualify for free or reduced price lunch. PS 24 and PS 37 serve adjacent districts in the northern Bronx. PS 24’s zone includes much of Riverdale; it’s predominantly white and has a median family income almost two and a half times greater than that in PS 37’s zone. Last year, the superintendent of District 10, where both schools are located, resigned amid charges that she allegedly tried to keep Black and Latino children out of the Riverdale school. In Brooklyn, PS 8 has served a zone where the median family income is more than five times that of the adjoining school zone, for PS 307. That school gets many of its students from the Farragut Houses project across the street. In 2016, the city adopted a controversial plan, taking some students who previously would have gone to PS 8, also in Brooklyn Heights, and enrolling them in PS 37. The Department of Education has said it will take several years to see any signification impact from this change. But zones are only part of the problem. While most families enroll their kindergartener at the school down the block, many parents opt out of their zone. Affluent families slated for an elementary school not to their liking may chose a private school or try for a public-school gifted program. These are concentrated in affluent neighborhoods and disproportionately white and Asian. Publicly funded, privately run charter schools also offer a way out, and tend to be particularly popular with Black parents. And part of peculiar school segregation problem New York City faces today could be blamed on schools that are not zoned, owing to changes made under the Bloomberg administration. 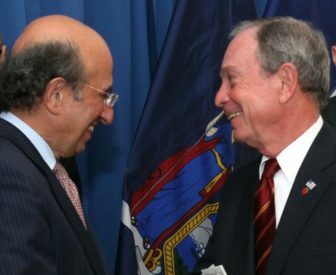 Mayor Bloomberg with his first chancellor, Joel Klein, who downplayed the importance of integration. The relatively few city efforts to address segregation faltered in the early 2000s after a Supreme Court ruling made it more difficult (some say impossible) for districts to consider race in assigning schools. The ruling met a receptive audience in Mayor Bloomberg’s first schools chancellor, Joel Klein, who downplayed the importance of integration. “To prioritize desegregation would have led to less good outcomes,” he reportedly said recently. Under his leadership, the Department of Education moved to eliminate race sensitive policies in District 1 and elsewhere and instituted changed that, while intended to make gifted and talented programs fairer, ended up making them less diverse. Klein also liked to say a student’s ZIP code should not be her destiny. So the Bloomberg administration chipped away at neighborhood schools, largely doing away with them for high school, creating more choices for middle schools and trying to push Community School Districts to abandon zones for elementary school. Instead, parents would select from a smorgasbord of district and citywide traditional public schools and charter schools. Admissions were to be race and class blind. But even without set- specific policies to promote socio-economic or racial diversity , one could expect that letting children leave their segregated neighborhoods would lead to more integration. It hasn’t worked that way. The city has three completely unzoned Community School Districts. Two – 7 in the South Bronx and 23 in Brownsville, Brooklyn – are overwhelmingly poor and Black or Latino, making traditional racial and economic integration difficult. The other is District 1, the diverse piece of Manhattan that is home to PS 64 and the Earth School. Many other districts have at least one non-selective unzoned program open to any child in the district. Some of these programs were designed as magnet schools to attract affluent and white parents, and they may have succeeded too well. As Nikole Hannah-Jones wrote in her acclaimed article “Choosing a School for My Daughter in a Segregated City,” none of her middle-class neighbors, Black or white, in Bedford-Stuyvesant sent their children to the zoned local schools. “They had managed to secure seats in the more diverse and economically advantaged magnet schools or gifted-and-talented programs outside our area, or opted to pay hefty tuition to progressive but largely white private institutions,” she wrote. District 2, which cuts across Manhattan, has two schools open to any child in the district. One, Ella Baker, has slightly more Black and Latino children than the district as a whole but is 20 percent more affluent. The other, Midtown West is less affluent but had a substantially higher percentage of Black and Latino students than the zone. The choice schools also may differ from their nearest public school neighbors. Midtown East is about five blocks from P.S. 111 Adolph S. Ochs. But while at Midtown East, 21 percent of students are low-income and 29 percent Black or Latino, at Ochs 66 percent are Black or Latino and 52 percent low income Ochs also has far more students not proficient in English or with special needs than its neighbor. And its test scores are far lower. Similar disparities exist elsewhere, particularly in Manhattan and Brooklyn. Manhattan School for Children, a choice school on West 93rd Street, is 28 percent Black and Latino, with 14 percent of children considered low income. PS 163 a few blocks away on West 97th Street is a neighborhood school, albeit one with a gifted program, and has far more low-income children than the unzoned school to its south. The preponderance of affluent white students has raised concerns at some schools of choice, many of which pride themselves on being progressive and diverse. Academy of Arts and Letters, now a kindergarten through grade 8 school in Fort Greene, Brooklyn, opened with an overwhelmingly Black and Latino and low-income student body. But in the last decade, the school changed and by last academic year, according to the New York Times, the kindergarten was half white, with only 12 percent of the students classified as low-income. Some of this reflects changes in gentrified Brooklyn, but not all of it. PS 20, which shares a building with Arts and Letters, remains 75 percent Black and Latino and 68 percent low income. It is a neighborhood school with a dual language program and decent test scores, but apparently lacks the appeal of Arts and Letters. Why, though, don’t these program hold the same allure for poor families that they do for affluent ones? Unless one thinks the lottery is flat-out rigged – which few people do – the students admitted to a choice school should reflect the racial and economic characteristics of those who applied. While Klein and Education Secretary Betsy DeVos see choice as an antidote to for inequities in education, many experts believe choice reflects and even enlarges those inequities. “Mounting evidence suggests that when school choice policies are not designed to promote racial integration – which most newer school choice policies are not – they generally manage to do the opposite by leading to greater stratification and separation of students by race and ethnicity across schools and programs,” Allison Roda and Amy Stuart Wells of Teachers College, Columbia University wrote in a 2012 study of school choice. District 1’s experience could serve as an example. In the 1990s, the community school board eliminated zones within the district, allowing parents to apply to any school in the area. In schools that had more applicants that slots, students were selected in a lottery set up to ensure an equal division of boys and girls and that the school would a mix of races and ethnicities, and later languages and academic skills. By 2007, following the Supreme Court ruling, the Bloomberg Department of Education maintained the lack of zones but removed the measures to ensure diversity. The effects of that change were stark, according to a study commissioned by the district. It found that between 1999 to 2011, four years after the city instituted so-called “open choice,” schools in the area saw increased disparities in their racial makeup and in the numbers of low-income students. Differences in standardized test scores between schools increased as well. This is not an aberration. When school choice is “wide open and there no control over the market, the mechanisms of choice are going to reinforce the existing level of inequality,” says Matt Gonzales, director of the School Diversity Project at Appleseed New York. By 2013, it had become glaringly apparent that, whatever their other effects, the Bloomberg choice and race-blind policies had done nothing to integrate the schools, even as some neighborhoods became more diverse. The scarcity of Black and Latino students at the city’s most selective high schools and the increasing “whiteness” of some top elementary schools caught people’s attention, as did the large number of Black and Latino children in overwhelmingly Black and Latino schools. So, in 2014 when Bill de Blasio became mayor, some expected him to embrace school integration. But he and Chancellor Carmen Fariña left many of the Bloomberg’s school choice policies intact and were slow to call for more integration. Some City Councilmembers, like Ritchie Torres of the Bronx, have been disappointed with the mayor's approach to school diversity. This dismayed some councilmembers, such as Torres. “The mayor has an equity and excellence plan (for education) but it makes no mention of school integration and it’s not clear how you can have equity and excellence without school integration,” says Torres. 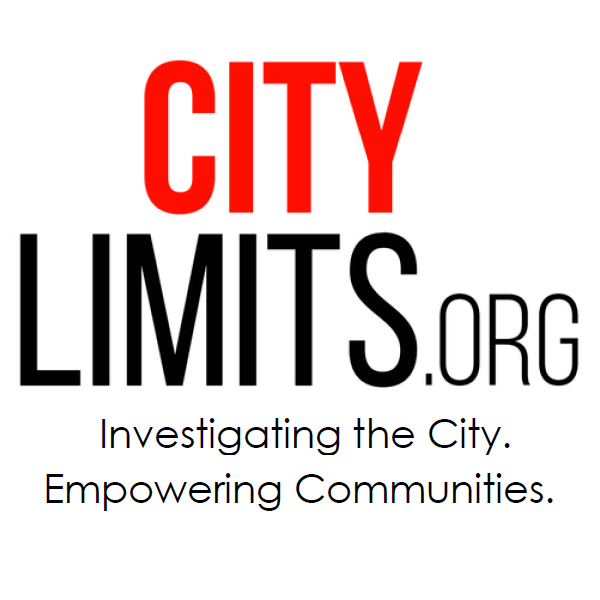 In response, the city in 2015 launched a pilot program allowing seven elementary schools to set aside from 10 to 60 percent of seats in their incoming class for low-income students, English language learners, students in the child-welfare system, or children who have incarcerated parents. In 2016, the number had increased to 19 schools, including Arts and Letters and the Earth School. According to the department, the elementary and high schools this year “met or exceeded nearly every one of their targets.” (Middle school numbers were not yet available.) A department spokesman says more schools will be able to apply to participate in the program next year. The program was inspired by PS 133 in Park Slope. When the largely dormant debate about school segregation began to reopen in 2012, the school was about to expand and move into a new building. The Department of Education suggested the school be unzoned and open to families in two adjacent Community School Districts, 15 and 13. Parents and administrators at the school agreed, but, adopting a system in place at charter schools, they proposed that, rather than select students at random, the school give preference to low-income children and English language learners. The department agreed. The school now is racially diverse: 27 percent Black, 32 percent Latino, 31 percent white and 3 percent Asian. However, it still has relatively small numbers of English language learners and low-income students, according to state data. Elena Romero is a single mother who teaches at CUNY. She lives in Sunset Park but sends her three children, two of whom have special needs, to PS 133, despite the difficulty of getting them there and back. “From my end of it, I would prefer my kids go to school with all kinds of children,” Romero says. A member of the School Leadership Team, she praises PS 133 for its efforts to accommodate a range of parents, such as offering scholarships to children whose parents can’t afford the afterschool program and making the school library open to parents who otherwise might not have access to a computer. “There’s a sense of community there that goes well beyond the classroom,” she says. The Department of Education points to other moves it has taken to integrate schools. 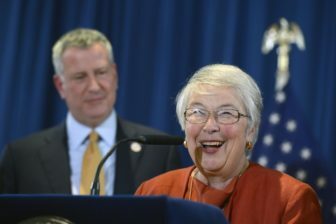 “Increasing diversity in our schools will help our students succeed, and we’ve worked towards this goal across city schools, including through the citywide Diversity in Admissions initiative, expanded Dual Language programs, and a record percentage of students with disabilities in general education settings,” said Will Mantell, the department’s first deputy press secretary. The city also has sought to increase the diversity of gifted and talented programs and more controversially, has tried to rezone some segregated districts, sparking opposition, particularly among parents in Lincoln Towers whose children were slated to attend PS 199 and would now to go to 191. But not everyone is impressed. The department’s strategy is “better than what we were doing before” but not enough, says Torres. He has introduced a bill that would establish an Office of School Integration within the Human Rights Commission to study racial segregation in public schools and recommend possible remedies. “The DOE should be subject to independent review,” he says. Instead District 13, District 1, Torres and others are looking to a system where parents could choose among many schools but each would have to reflect the makeup of the whole area. As described by its founder, Michael Alves, under this method, known as controlled choice, “all available seats must be allocated and assigned in a way that promotes diversity and avoids racial/ethnic segregation and is fair to all diverse student population groups.” It is in some respects similar to what was in effect in District 1 in the 1990s. Districts 1 and 13 have been working with Alves and have received state grants to develop their programs. The one for District 1 would focus on one low performing school – Roberto Clemente – and make it a magnet school. “What we’re going to put in there has to really work. You come up with something that has a track record of educating poor kids well … and also works for more affluent kids,” Alves says. Along with this, Donlon envisions a lot of outreach before parents enter the lottery and giving priority to families with low-incomes or educational levels. There needs to be oversight “so there was no question [the lottery] was transparent and fair and equal,” she says. Services also need to be considered. Donlon notes that any parents cannot select a school that does not offer free after school. Some may need special social services. The exact parameters of any plan would vary from district to district. In some “diversity” might mean income; in others it might mean language proficiency or a balance of homeless student. So far de Blasio has not endorsed controlled choice. The District 1 and 13 plans appear stalled for now, with Donlon citing delays at the Department of Education. A DOE spokesperson indicated those effort is continuing but said the department was moving cautiously to insure that any such program be done correctly. De Blasio and Farina have not embraced controlled choice. One obstacle in New York is gap between the city’s strong schools and its weak ones. Families who live in an area with a highly regarded zoned school will be likely to resist any program that opens their school to others and reduces their child’s chances of getting in. “People are fine with diversity but feel threatened if their spot is taken,” Romero says. Unlike Klein, those supporting desegregation believe it is possible. Torres says integration faded from public debate across the United States partly as a result of school busing and the fierce opposition to it during the 1970s. Now, he says, “We’re developing more sophisticated methods for desegregating schools without creating a political firestorm. … There is a middle ground between school busing and doing nothing,” he says. This is one of the better articles, clearly articulating many sides of this complex problem. Though one of the challenges that does not get enough attention (probably due to lack of research) is how parent’s preferences for types of educational environments (authoritarian, regimented, emphasis on test scores vs. those schools that emphasize social, emotional and academic learning equally along with greater student freedom) may reflect the socio-economic disparity of students who tend towards one or the other of these “types” of school environments. Unless the DOE mandates that all school principals create environments based on standard social norms, thereby minimizing choices and differences, we will either have to come to terms with variance between schools or we’ll need to figure out how to honor free choice with equitable resource allocation – something that is also sadly missing. The Earth School currently has 50% students who are eligible for Free/Reduced Lunch. This is going nowhere. Even progressive deBlasio won’t touch the issue of segregation. Middle-class people want safe schools for their kids. I’d wager all people want safe schools for their kids. Tell us more about how you think safety connects to the questions or racial and economic diversity, Native New Yorker? The NYC middle-class has been through all this before. The violent troubled schools are the schools with large numbers of black and Hispanic students. That’s just the truth. Since we are talking about integration do you think white middle-class parents will willingly send their kids into those troubled schools? I don’t think so. And they will fight like hell if the DOE tries to send those same endlessly troubled kids into their neighborhood schools. Or they will put their kids in private/parochial schools or more likely move to the suburbs. Ask your neighbors who were around the 1960s and 70s, they can explain it better than I can. BTW don’t believe deBlasio’s school crime numbers, talk to teachers about what’s really going on. I’m not sure middle-class parents’ willingness is really an important consideration — after all, white people’s desires for integration weren’t always (which is to say, ever) the driving force behind getting rid of separate lunch counters and water fountains and the like. What’s more, my middle-class parents sent me to a majority-minority high school. I send my kids to elementary and middle schools in which whites are a stark minority. And my folks did not feel, nor do I feel, that there was anything particularly remarkable about that choice. If school violence were properly understood as a racial problem, all the families in white suburbs that have seen school shootings in the past 20 years would be flocking to the five boroughs. And yet I don’t see deBlasio or anyone else exactly pushing aggressive school integration strategies. This is a dead issue in NYC. Clever point you make about school shootings but we both know the real issue in NYC is things like teacher assaults, student robberies and assaults. I don’t know that a lack of interest on Bill de Blasio’s part is what qualifies something as a dead issue. You’re correct that it’s politically dangerous territory, but inertia doesn’t equal validation. And yes, you’re right: lower-level crimes are more common than school shootings in general. I just reject the notion that presence of those crimes is inversely related to a school’s White population share. But let’s say I’m wrong and you’re right–that mostly minority schools are naturally dangerous. Wouldn’t the wise thing be to add some White people and make it all better? Great article. Next up please look how District 2 high schools (and the politicians that engineered them) have protected “choice” except when they don’t want to. I’m referring to the screened high schools that have fewer special education and ELL students than other public high schools down the avenue. And while some of these schools appear to be statistically more diverse, they still aren’t really reflective of overall NYC diversity. Does Eleanor Roosevelt H.S. have 40% Latino students? While the likes of Cuomo and other Democratic reformers have pushed “choice,” the white folks of Manhattan get to preserve their high schools only open by zone! They want “choice” when the school across the street has too many students of color, but they want a zone (but screened) school when they’re the white majority on the block! Last fall bone fragments forced the removal of chicken tenders from New York City school lunch tables. Now that a student has found a metal fragment, the bird’s off the menu again. In moving to close CJHS 145 in the Bronx, the authors argue, the city is ignoring the policy choices that have hindered the school’s performance—and the successes its staff and students have achieved despite those obstacles. A video op-ed.